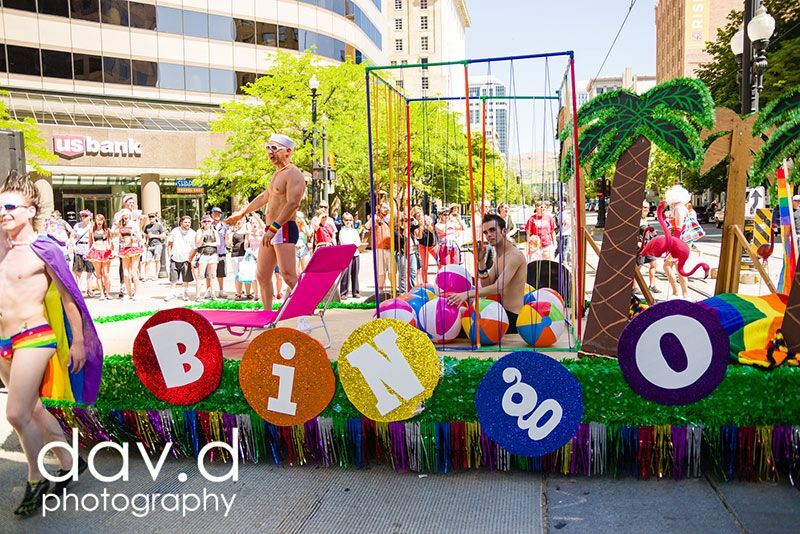 Numbers are in for the 2014 Utah Pride Festival and Parade, and it looks like another banner year for attendees, but profits to help run the Utah Pride Center are down. At its board meeting Monday, financials for this year’s annual festival were presented by Festival co-directors Jen Parsons-Soran and Michelle Stephen. This year, the Festival drew 34,608 people, including volunteers, sponsors, booth personnel and Center staff. Of that, 26,309 were festival-goers with tickets. Around 7,000 showed up for Saturday’s festivities, and over 19,000 attended on Sunday. Last year’s festival drew around 28,000 total participants, nearly a 24 percent increase in total attendance this year. Salt Lake City police estimated the Utah Pride Parade as a total of 35,000 participants, including all those marching in the parade and those on the sidelines watching. Nearly 900 volunteers staffed 1,400 3-hour shifts plus 14 community partner organizations covered such things as the merchandise booth run by the Utah Bears, the wine bar run by QUAC, etc. There were 248 vendors, up from 175 the previous year, 143 parade entries, up from 125 in 2013 and between 8,000 and 11,000 people participated in parade entries, according to the report. Income for the event was reported at $663,330. About 37 percent of that was from admissions ($246,000), 27 percent in beverage sales, 25 percent in cash sponsors, $2,500 pitched into the large rainbow flag in the parade, and $2,800 in tips at beverage stations. Expenses, however, were much higher this year than last at $528,282. Thirty-five percent of that was used in logistics (tents, signs, venue rental, insurance, etc. ), 15 percent for staffing and stipends, seven percent for security and safety, five percent for permits and insurance, and 11 percent for entertainers and their travel. The net proceeds, therefore, ended up at roughly $135,000, almost half of 2013’s $264,000. Total expenses in 2013 were only $372,000. The largest increases were in entertainment — a $60,000 increase, and police/fire/EMS costs nearly doubled. Logistics were up 50 percent in part because of the larger footprint of the event this year to accommodate the additional vendors. The cost of beverages rose 30 percent and staff costs increased 29 percent, though that number can likely attributed to more accurate reporting and the fact that “appreciation stipends” were awarded to key Festival volunteers. Sponsorships came in at $431,955, of which $97,300 was in cash, including $8,000 from Bruce Bastian. The balance of that amount was in-kind donations, such as $38,000 from Le Croissant Catering which hosted the Grand Marshal Reception, and media donations at a value of $191,000. QSaltLake was a Diamond sponsor, the highest media level with a value of at least $25,000 in media. Discussion about the event centered in part around the disagreement the board had with leaving the tickets at $8 in advance, $10 at the gate for each day or $16 in advance for a weekend pass. The board had wanted a $15 price for Saturday night. Simple math would show an increase of $28,000 from Saturday ticket sales, but Parsons-Soran noted that attendees would have to see a $15 valuation in the entertainment. On Saturday, the Festival entertainment was Betty Who and drag performer Sherry Vine. On Sunday it was Steve Grand and Joey Arias. Both days featured a full schedule of local performers as well. Parsons-Soran hinted that the community would be excited for the entertainment for the 2015 Utah Pride Festival, but negotiations were still being handled and an announcement would be very premature. Already, the organizers know that the parade will have an increase in expenses next year, as the requirement for porta-potties will be increased from 9 to 100 and additional safety personnel, according to the Salt Lake County Dept. of Health. The 2015 Festival will begin on Thursday, June 4 with the Interfaith Service, Friday June 5 Grand Marshal Reception and the Festival on Saturday, June 6 and 7. The parade will happen on Sunday, June 7. Changes to the Festival schedule are anticipated and will be announced as the event nears. Did you mean to say 90-100 increase in bathrooms? Going from 9 to 100 seems odd. I agree with Chris…that must be a misprint. I was there and there were alot more than 9 port-a-potties. Also…maybe if the price of admission on saturday was lower, more folks would attend. It may decrease ticket income per attendee…but the decrease would be recouped by more folks able to afford to attend on saturday, and people attract more people which also leads to greater sales in beverages. Besides SUNDAY is the BIG day. That admission price is more than fair. Saturday is not that attractive. I dont go on Saturday. I dont see the value. And you want to increase Saturday's ticket price??? No. There were only 9 porta-potties required in 2014. Now that police estimated the crowd at 35,000, they are required to now offer 100. The porta-potties requirement noted was for the parade. Not the Festival. Also, the 9 porta-potties figure is for the parade only. The amount of porta-potties for the parade, was indeed, too low. There were people waiting in line for 20 minutes. The costs will go up. I just can't see why they went up by $200k. I think it probably IS more truth in reporting. Pride has always seemed to be reported through someones rose-colored-glasses. And without scientific studies, how can anyone attribute attendance to performances. I see all the boasting about bringing in high class talent, but the stage area still only holds so many people, and I haven't seen increased crowds at the stages for 10 years. "Bigger and Better" … every year… seems to be more about hubris, than bringing community together and raising funds to cover the costs of the Utah Pride Center.